Thrills, spills, and chills. 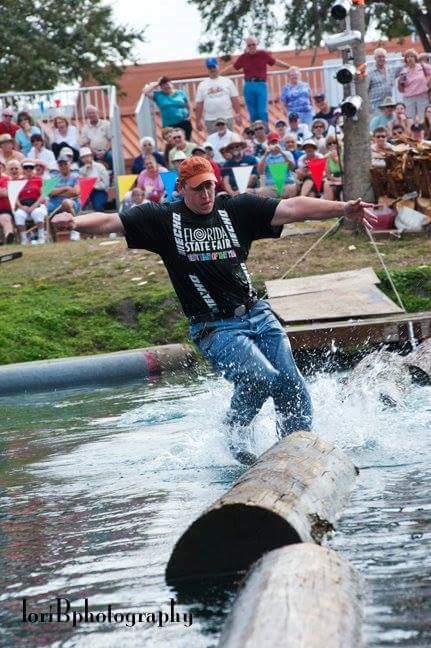 Two Men battle it out, by running on top of a log in the water. With a 2 out of 3 fall match, each competitor uses different tactics to put the other in. They can bob the log, run backwards or forwards, and even splashing water in their opponent’s eyes, but they cannot cross over the center line or touch their opponent. 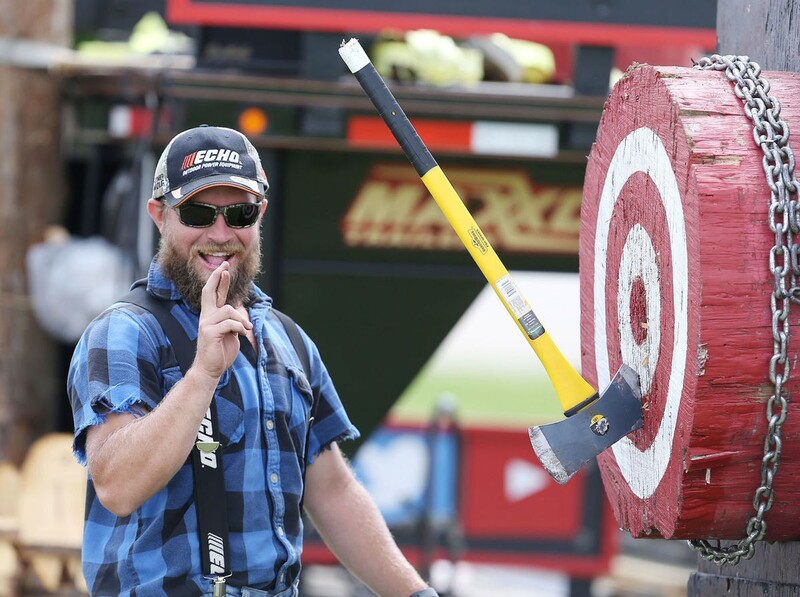 With hair splitting accuracy, the competitors toss their 3 ½ pound double bit axes at a target from 20 feet. The center bullseye is 4 inches in diameter and is worth 5 points, then the next ring is worth 4 points, then 3 points etc. Each competitor has one practice and three throws, the one with the highest points wins. This event simulates a tree standing in the forest. 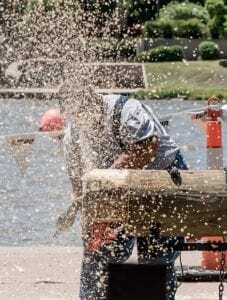 At the start of go, each Lumberjack thrust their axe deep into the trunk of the tree as fast and hard as they possibly can. The idea is, who’s ever tree falls first, is the champion. Let the chips fly. Timber! 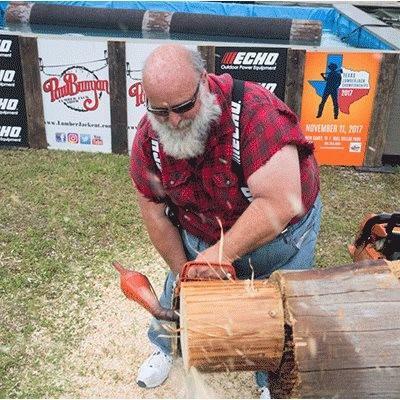 These Lumberjacks sure love to use their 80 CC Echo Paul Bunyan Lumberjack Show Chainsaws, with a giant expansion chambers, doubling the horse power. The noise accentuates the excitement and can be heard from a far. Don’t blink, or you’ll miss the action. The Lumberjacks take their 6 ½ lbs. razor sharp New Zealand Speed Axe, stand on top of a horizontal log, swinging the axe between their feet, just missing their toes by a fraction of an inch. Speed, strength, and accuracy make up this event. Need I say more! This is the most dangerous of all Chopping events. 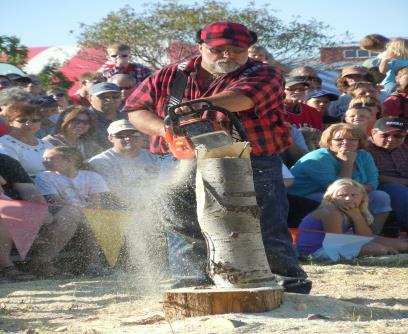 For this event, the Lumberjack starts out by cutting a notch or pocket in the side of the 12-foot high tree. 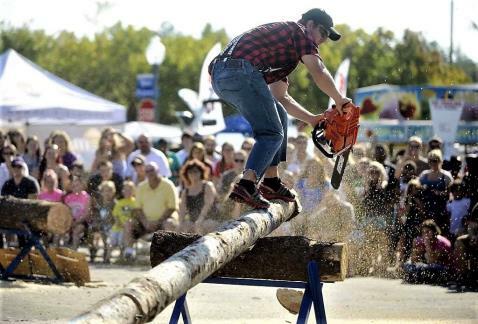 After the pocket is cut, the Lumberjack inserts his 8-inch-wide Springboard into the notch. He proceeds to climb onto the Springboard and cuts his second notch in the side of the tree. Places his second Springboard into this notch and climbs up. 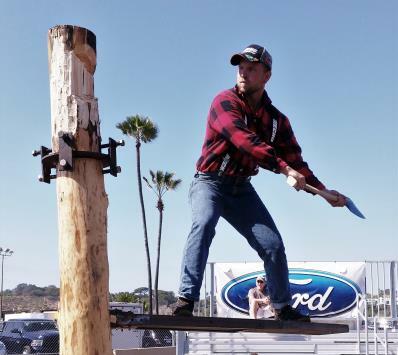 Balancing on the second board, he begins to chop through the log while standing over six feet high up the in air, and springing up and down, with each powerful stroke of the axe, striking the side of the log. 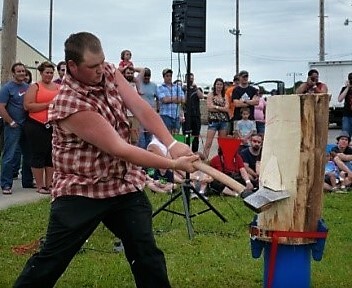 After he chops almost ¾ of the way through the first side, he will then switch to the opposite side. 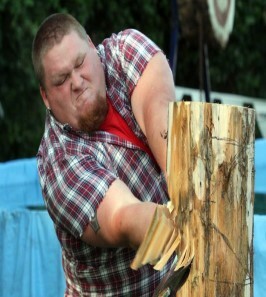 He continues chop until he cuts through the log and falling the top of the tree to the ground. 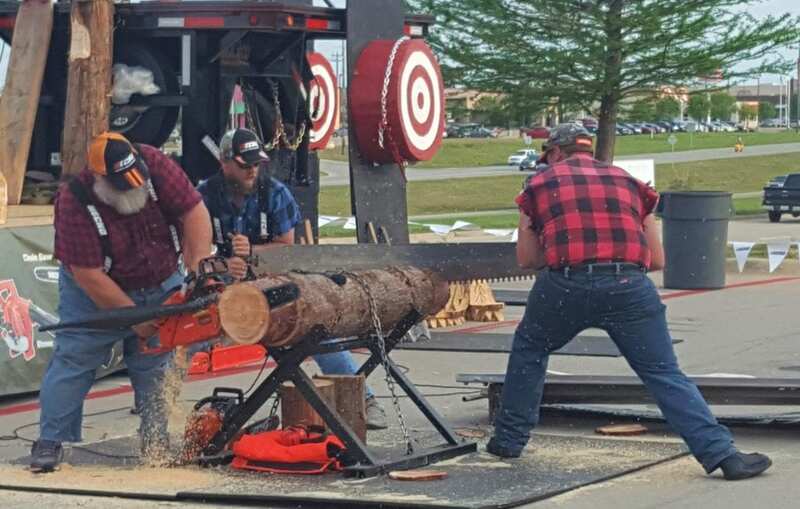 Each Lumberjack takes their position on each side of the log, gripping the handles of the 70 razor sharp teeth of this 6-foot crosscut saw. Pushing and pulling the saw back and forth, ripping these razor-sharp teeth through the wood. With each powerful stroke, they get closer and closer to the other side of the log. No factory stock chainsaw can beat them! This event simulates a tree that has fallen over a brush pile in the woods. 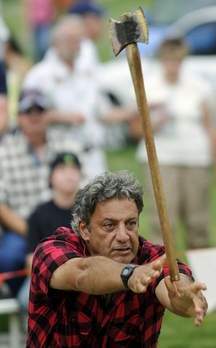 The log is 25-feet-long, with one end of the log resting on the ground, the other end 4 to 5 feet in the air. 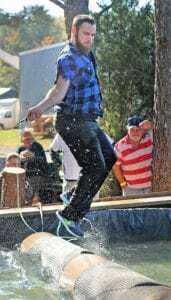 At the start of go, the Lumberjack picks up his chainsaw and steps on the end of the log that is on the ground, proceeds to scamper up to the other end of the log. He will then start the chainsaw, cuts a disk off the end of the log, shuts off the saw, turns around and runs back down to the starting point. 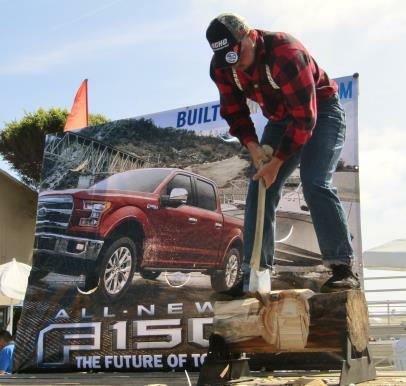 This is a times event, with the fastest Lumberjack wins. This is a fun event for children. 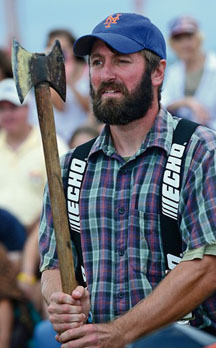 The lumberjack says he is going to make something. The kids try to guess what he is carving. When the children think they know what he has made, he comes up with something totally different. 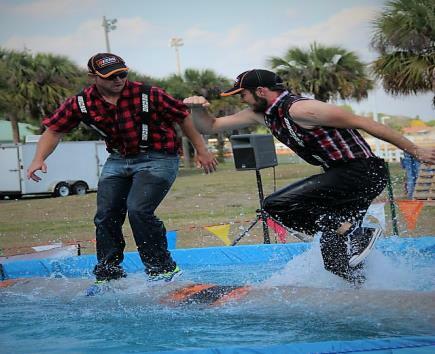 Also known as Trick and Fancy Log Rolling. 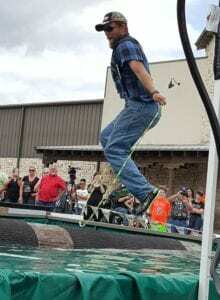 These Lumberjacks show off their tricks and skills while balancing on the Log Rolling Log in the water, by jump roping, juggling, and a whole lot of fun. 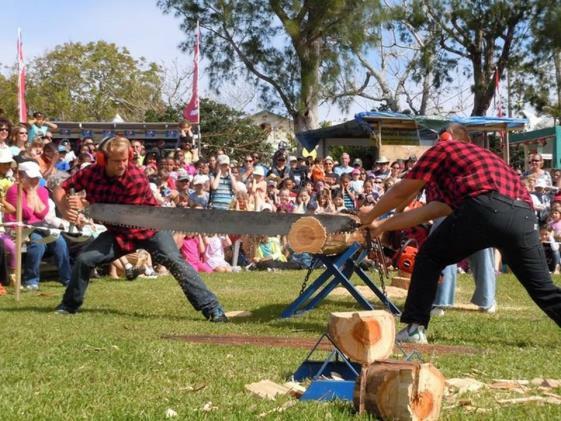 The Lumberjacks are ready to take each other on, Chainsaw against the crosscut saw. 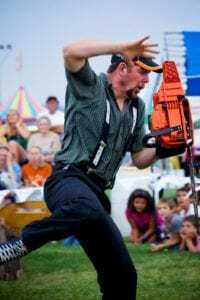 At the start of go, the sawyers take their old fashion Missouri whip, pushing and pulling with the furry of an old fashion steam engine, while the third Lumberjack starts his chainsaw to but a disk as fast as his saw will allow him. Let’s see who will win, muscle again machine, you will be surprised. Multiple logs ranging from 9 to 16 feet in length are tied together like a chain link. 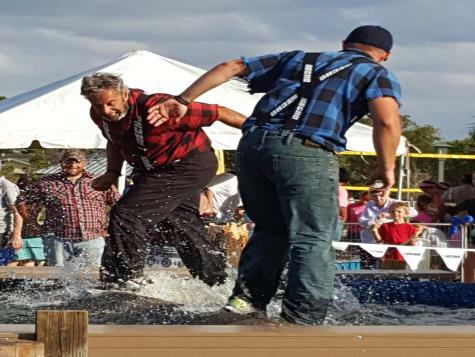 This event is a times event, having the Lumberjack run from log to log starting at one end and finishing at the other end. 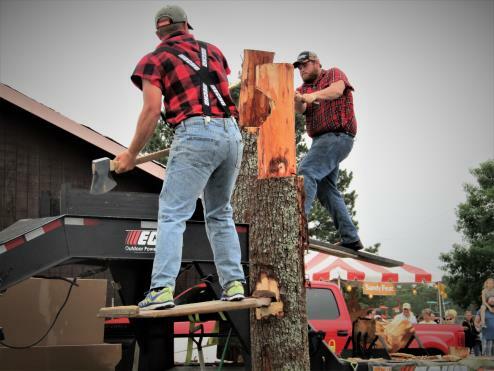 This is a very hard event as the logs bob, turn and weave while the Lumberjacks runs across each log, making this quite the challenging.